With 15.7894% of the season in the books, an early review of the 2013 IZOD IndyCar Series (IICS) season seemed to be in order. 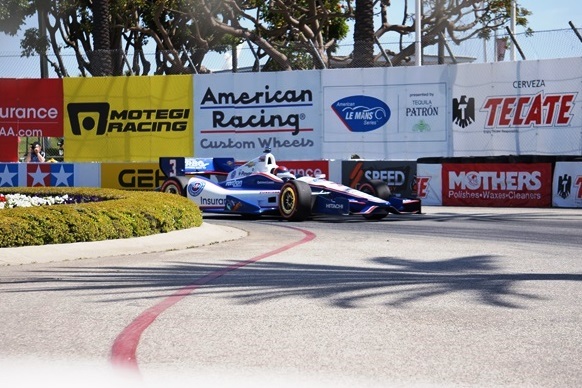 The Toyota Grand Prix of Long Beach helped to cement a couple of themes that seem to shaping up in this sophomore season of the Dallara DW12 racing platform, two engine manufacturer era of American open-wheel racing. 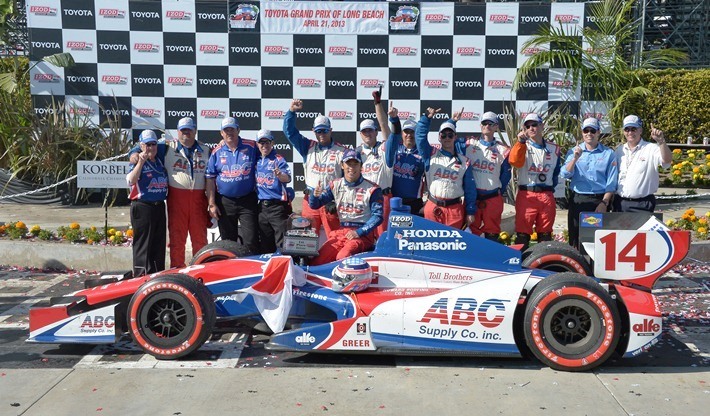 First, congratulations to AJ Foyt Racing for helping to deliver a team effort role in Japanese, and former F1 driver, Takuma Sato's first win in the top rung of world automobile racing. A fully honest win won racing starting from P4 at the drop of the green flag aided only by a flawless performance driving the Honda-powered DW12 on the track, and team work in the pits for tires and fuel. Takuma Sato says joining AJ Foyt Racing put him in position to become the first Japanese driver to win an IndyCar race. 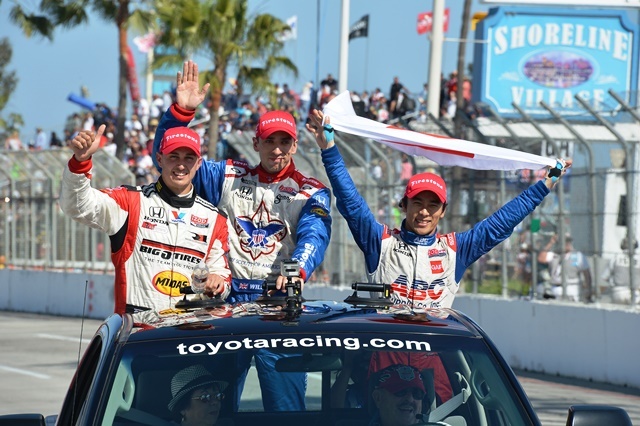 Sato returned to Japan on Friday to speak about his historic win last Sunday in the Grand Prix of Long Beach, just his third race with the team. "Motorsports is a team sport and you can't win without complete effort from the team," Sato said at a news conference. "The thing about AJ Foyt Racing is that regardless of the conditions they provide the stability needed to win." 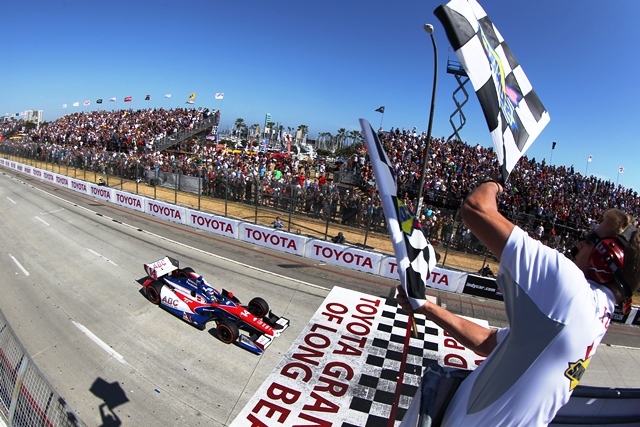 The win at Long Beach came in Sato's 52nd career start in IndyCar, but was the first for AJ Foyt Racing since Airton Dare won Kansas in 2002. 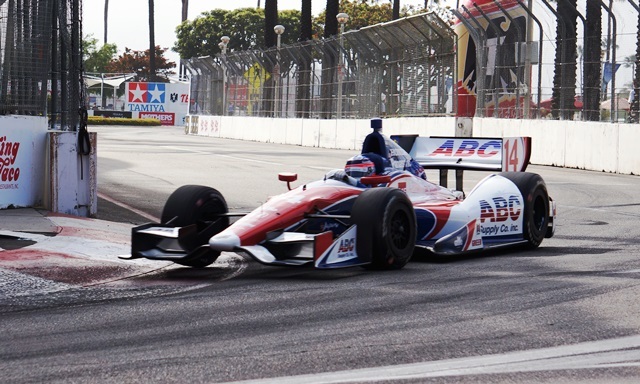 IndyCar pulled out of Japan after the 2011 race, and Sato said he hopes his win at Long Beach will help return the series to his homeland. "People in Japan love IndyCar," the 36-year-old Sato said. "I can't bring it back myself but I hope in some small way the win in Long Beach will help bring it back. I want to race in the Indy Japan before my career is over." When the dust settled on the third race of the 2013 season, the top five drivers in the points for the IZOD IndyCar Series season championship are 1) Penske Racing's Helio Castroneves - Chevy - 99 points, 2) AJ Foyt Racing's Takuma Sato - Honda - 93 points (the only race winner this season in the top five), 3) Target Chip Ganassi Racing's Scott Dixon - Honda - 89 points, 4) Andretti Autosport's Marco Andretti - Chevy - 87 points, and 5) Dale Coyne Racing's Justin Wilson - Honda - 81 points. To paraphrase Takuma Sato in what he stated in the interview above, these drivers through three races "regardless of the conditions they (the teams and drivers) provide the stability needed to win." 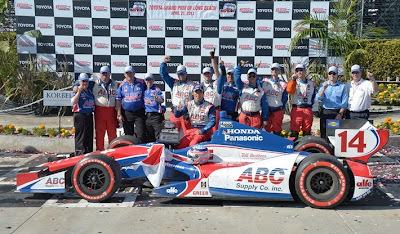 Honda, after not showing so well in the first race of the season at St. Petersburg, Florida, has rebounded to the point that one could say that if you are driving for a team with a Honda engine, you may have a shot at an IICS Championship. Honda was able to occupy 9 of the top 15 positions at race's end at the Toyota Grand Prix of Long Beach - which Honda and HPD consider their home track being that their main facility is located in Santa Clarita. 21 - Positions improved by Justin Wilson, the most positions gained by any driver. Wilson finished third. ["I think (the competition is) just so tense," said Justin Wilson, who charged from the 24th starting position to earn third place at Long Beach in the No. 19 Dale Coyne Racing entry. "There are so many drivers in this championship that are capable of winning races. When you do your lap in the car, you don't know when you come in if you're first or 25th. 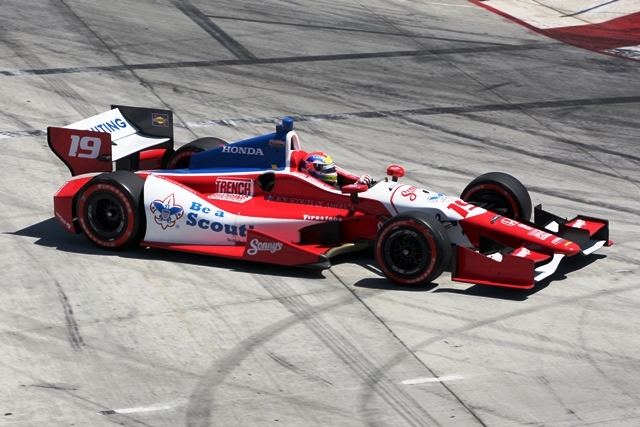 Finally, who can imagine becoming more Red, White, and Blue than the Boy Scouts of America who wraps the DW12 of Justin Wilson! Quite fitting for the ultimate professional open-wheel racing series in America to be led by such a thematically colorful, yet international contingent. Next weekend is the running of the fourth straight road/street race of the season and the last race before the INDY 500, the world's most famous 'oval' race track. The drivers become the boys and girls of Brazil (Helio's home track) as they race at an event facility known in Sao Paulo for it's Samba Festival held during pre-Lenten celebration of Carnival. The fruits of real-time, in-season race development program become realized after only four races into the first Grand-Am GX Class season. 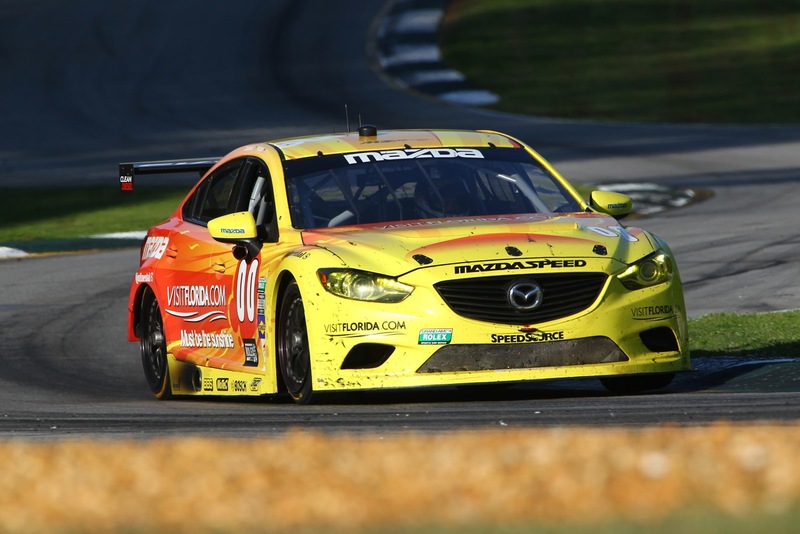 The all-new Mazda6, powered by a production-based SKYACTIV-D Clean Diesel engine, scored a win in the Rolex Grand-Am GX race at Road Atlanta. In 2013, the Grand-Am racing series for full-bodied GT cars added a new class of racing platform to its field of formally pedestrian but hardened sedan cars that can be purchased from dealerships around the country. The GX Class will have 13 models from 12 different manufacturers to choose from, based on the list of cars eligible for the new GX class in the Rolex Sports Car Series. Eligible cars announced for the class include the Lotus Evora GX, Porsche Cayman, Mazda6 with the SKYACTIV-D turbo diesel, Audi TT, BMW 1 Series, Chevrolet Cruze, Ford Focus (four door), Hyundai Genesis, Subaru BRZ, Scion FR-S, Nissan 370Z or Altima, and Volkswagen EOS. Joel Miller and Andrew Carbonell drove the #00 Visit Florida Racing Mazda6 to the win, with team-mates Sylvain Tremblay and Tom Long finishing third in the similar #70 SpeedSource Mazda6 SKYACTIV-D. It was a three-way battle for most of the race with a Porsche Cayman splitting the two Mazdas. This win represented a day of firsts for Grand-Am competition and for Mazda Motorsports. This is the first-ever win for a diesel-powered car in Grand-Am competition. It also marked the first win for the all-new Mazda6 in any race series. It was the first Grand-Am race win for drivers Joel Miller and Andrew Carbonell. Miller is a former Mazda Motorsports Scholarship winner, having won the Skip Barber National Championship in 2007. 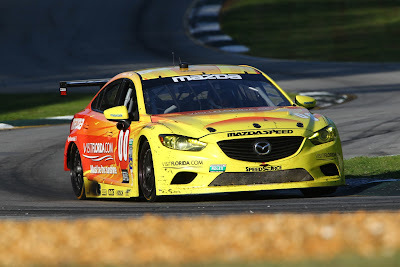 Carbonnell has been racing Mazdas with Freedom Autosport for many years, and was part of the team that delivered the 2011 Continental Tire ST Manufacturers Championship to Mazda. Carbonell was substituting for Miller’s usual teammate, Tristan Nunez, who had a schedule conflict with another race in Long Beach. "The new Mazda6 prepared by SpeedSource ran perfectly," said Joel Miller, co-driver of the #00 Visit Florida Racing Mazda6 in a post race interview. "The torque of the SKYACTIV-D pulled up the elevation changes around Road Atlanta circuit strongly and the Mazda6 handled beautifully. During the course of the race we attacked when needed and paced ourselves when required. The event had only one caution during the two-hour and 45 minutes race, thus there was hardly any time to relax. The SpeedSource crew was in constant communication with myself and co-driver Andrew Carbonell as we worked through traffic. Bringing home the victory for the SpeedSource crew who worked so hard on this program brings great joy and I cannot wait to continue the [development] program. Over the past eight years Mazda has taken me from karting through their ladder program. I’m proud to be racing the Mazda6 and to be a part of Mazda history in gaining the first SKYACTIV Technology victory." 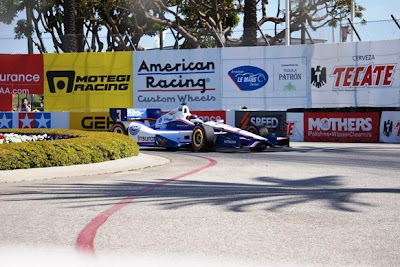 Joel Miller is the Southern California driver who's mother gave title to a 2011 documentary featuring the Star Mazda Series, an open-wheel driver development series that has since changed its banner to the Pro Mazda Series. 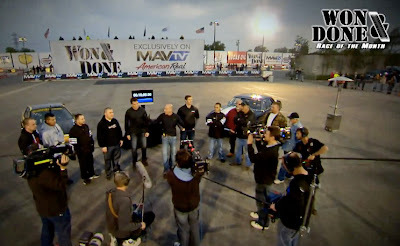 "Driven To Race" was billed as a documentary film effort about what it takes to win which garnered several film festival awards when it was debuted. 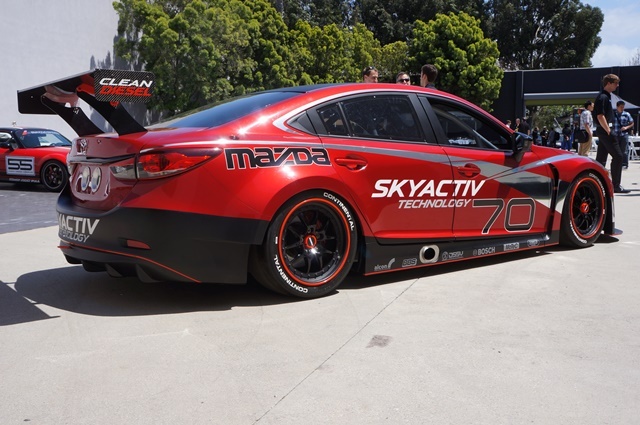 The truth behind this new Mazda6 SKYACTIVE-D development and win in the Grand-Am GX Class can be summed up by the owner of SpeedSource Engineering (the engineering firm behind the race tuned Mazda effort), Sylvain Tremblay. "While Joel and Andrew sprayed the champagne, this win truly defined the expression, ‘team work.’ The victory is shared with everyone at SpeedSource, Mazda North American Operations and Mazda Motor Corporation, and is a tribute to the thousands of hours of hard work over many months," said Sylvain. "After that rough debut at Daytona, everyone stepped up to make sure we had a fast, reliable car as soon as was humanly possible. The normal plan with a new car is to spend the first year in development, the second year seeking race wins, and challenging for a championship in year three. We are already at our year-two status after four races. We can’t wait to get to the Belle Isle course in Detroit for round five." 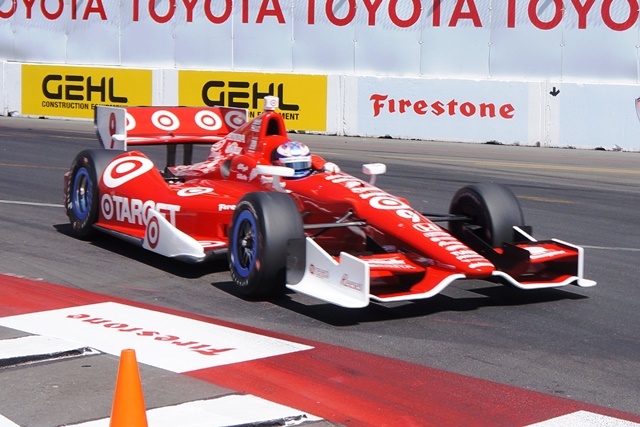 CJ, as David Calvert-Jones prefers to be addressed, took his first laps around the famed street course at the Toyota Grand Prix of Long Beach in preparation for the debut at his adopted "home" track for the second race of the 2013 American Le Mans Series presented by Tequila Patrón season. "It’s a home race," exclaimed CJ after a couple of test runs during open track sessions at the Toyota Pro/Celebrity Media Day, April 9th. "At least Long Beach is the closest we get to Australia! But I’m really thrilled to race at Long Beach for the first time. It’s a challenging circuit – absolutely no margin for error. Not even a millimeter." Most race car drivers begin with a vision of being one of this rare breed of dreamers and technicians when they get behind the steering wheel of a tractor, then a car on a dirt farm road, and eventually by the ripe old age of 8 or 9, find themselves competing with others with go-kart platforms used to develop the skills necessary to eventually race cars at the highest of professionally sanctioned levels. Not so with CJ - his life took a decidedly different path. Growing up around Melbourne, Australia beginning August 12, 1969, CJ became a pilot because around the land down under, the territory is so large (as with the United States' Alaska), if one wishes to get around and be useful to others, one needs to fly. Along the way CJ developed the talent and business acumen to manage large scale flying service operations and international investments. In 2004, CJ decided to relocate to Los Angeles where he flew helicopters outfitted as camera platforms and was able to deliver memorable action images used in films with recognizable titles of “Transformers,” “Secretariat,” “Domino,” “Horrible Bosses,” and “We Are Marshall” among many others. He became CEO of of Helinet Aviation Services, a best-in-class provider of helicopter flight services to a broad range of markets, including film, executive transportation, hospital patient transport, etc.. CJ was responsible for the successful management of Helinet's aerial coverage of the aftermath of Hurricane Katrina. As the only commercial operator cleared by the FAA to fly in the restricted airspace above the hurricane's affected areas and as a result, Helinet's aerial video footage was shown on all the networks in the United States and across the world. CJ is currently the owner and president of Helifilms, an aerial production company with offices in the United States, Australia, England and South Africa. This would be good enough for most folks but CJ's core passion is to be able to push the limits of man and his machines. He found his way to placing his physical command sensibilities to automobiles on a bit of a lark when a friend of his asked him to attend a Vintage Auto Racing Association event at Auto Club Speedway. While there, he was invited to drive a racing prepared BMW and was bitten to become focused driving automobile platforms at the greatest of speeds and limits. Last year, he decided to devote his driving attention to the IMSA GT3 Cup Challenge by Yokohama and came away with one class race victory and achieved the runner-up position (P2) in the season points championship. 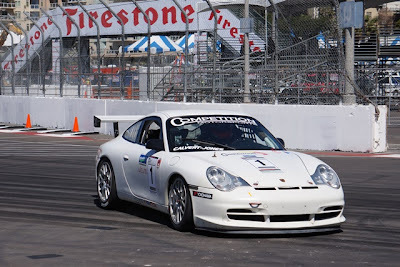 He was invited to try his hand at the final American Le Mans Series (ALMS) race of 2012 at the Petite Le Mans in Atlanta in a GTC Class Porsche and liked the experience. 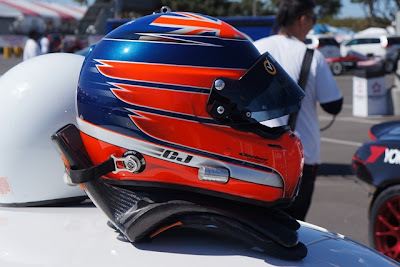 CJ now finds himself at the age of 43 in the troughs of a mid-life crisis of opportunity ... the opportunity to challenge man and his machines at the highest levels in American sports car racing. CJ expects that the crisis he will be delivering (not having) at mid-life is at least a podium finish against a field filled with drivers 75% his age, or less, who began driving four wheeled automotive platforms before the age that CJ took to the skies in Australia. Look for David Calvert-Jones ... CJ ... as he joins another Australian race car driver, IZOD IndyCar Series Will Power - who began being a race car driver by racing karts, racing the concrete lined streets at the 39th Annual Toyota Grand Prix of Long Beach April 19-21, 2013. You'll find CJ driving the second race of his rookie season in the ALMS GTC Class driving the No. 99 Competition Motorsports Porsche 911 GT3 for two hours on Saturday, April 20. NASCAR is back at Irwindale Speedway. After a year "dark" of NASCAR stock car racing, the nationally-known Southern California area short track will bring back the action and excitement of professional stock car racing to the "up close and personal" confines of the facility that many have called one of the best in the nation for fan accommodations and racing competition. Irwindale Speedway is the oval track "department" at re-opened Irwindale Event Center that also features the NHRA Street Legal Irwindale Dragstrip (home of MAVTv's wild new "Won & Done" drag racing reality show that debuts on April 4), the Advanced Driving Dynamics street safety driving school, the LA Racing Experience stock car racing school, and the new fun karting center. "There's a renewed attitude, a great sense of adventure. Drivers, crews and fans all telling us that they can't wait for this coming Saturday night," said track GM Bob Klein. 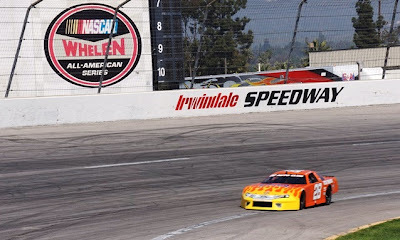 "We're very excited to be back in the stock car racing business, everyone on our staff is ready to get back to what Irwindale Speedway was built to do; and that's put on a short track racing show that's second to none. We had a great final open practice this past Saturday, and everything is in place for the fans." The new Irwindale operating team has pegged ticket prices at the same amount as when the track opened in 1999: only $15 for adults and $5 for kids 6-12. 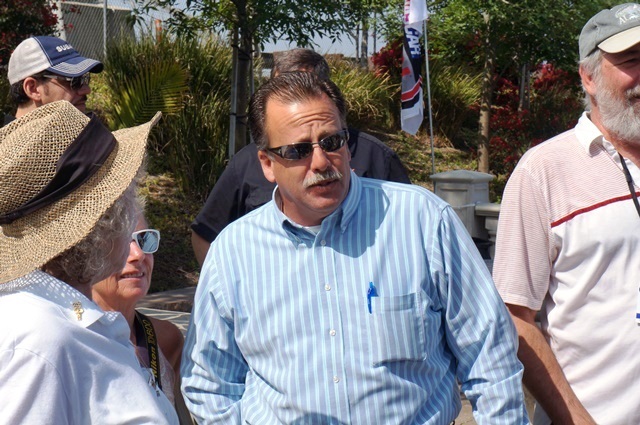 "We want to keep the NASCAR experience affordable for all families," Klein said. "We've got over 6,000 great seats and 14 action-packed nights of NASCAR from now until October. We want our fans to come back many, many times during the season." Spectator gates will open at 5pm on Saturday night April 6 with the track's famous "On-Track Autograph Session" first up on the night's agenda at 5:45pm. This personal opportunity for fans to meet the drivers, get a close-up look at their cars, and walk on the banked racetrack, is something that should be a part of every fan's experience at Irwindale. It's free with event admission and it sets the pace for a great night of stock car speed and excitement. "We're very proud to be a NASCAR Home Track, and we take that description to heart. 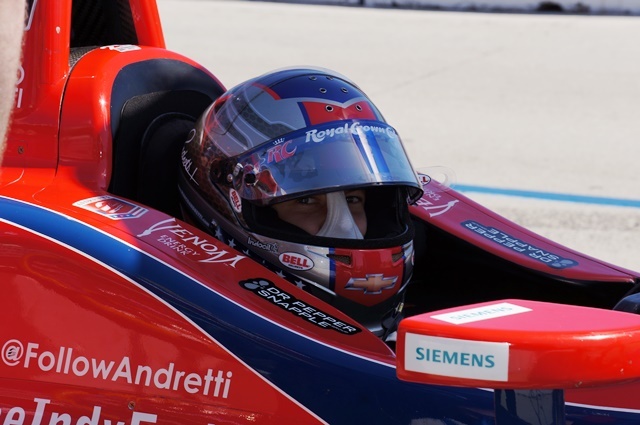 Our drivers are all always available to our fans right on the racetrack before our races," said Klein. 2013 Opening Ceremonies will take place at 6:30pm with a tribute to the fourteen driving champions from the last year of NASCAR and NHRA competition at the track (2011) who've been named the co-opening night Grand Marshals. Hot new recording star Paul Scott will sing the National Anthem as well as his hit single "NASCAR Crazy" (right from the starter's stand where he'll flag off a race), and police and fire vehicles will be on track to accept the track's thanks for their work in public safety. Saturday night's line up of NASCAR races will kick off with the Lucas Oil Late Models, and feature Super Late Models, Super Stocks, Mini Stocks, and a wild Demolition Derby to end the night with a little friendly fender-crunching fun. Racing will begin at 7pm and run until 10pm, and there will be a special fireworks show to celebrate NASCAR's return to Irwindale Speedway.